I love the cover of this CD, its so cute but still definitely cool with its super-hero feel! 'Flying' is Recess Monkey's seventh studio CD for children ages 3-8, with a run time of 47 minutes. 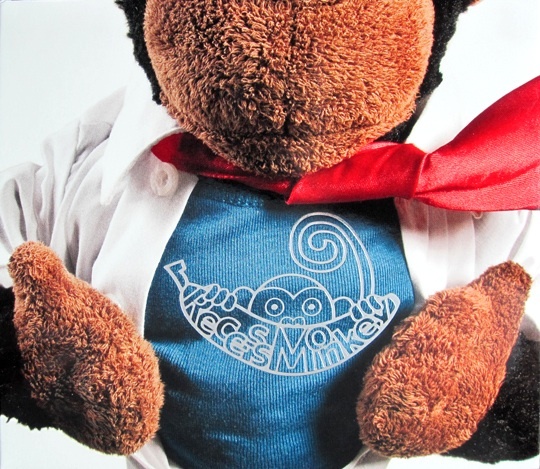 The three inspirations behind Recess Monkey are elementary school teachers (Jack Forman, Daron Henry and Drew Holloway) who met while working at the same Seattle school and brought their real life children's experiences into musical compilations. While ditching their day jobs, they transformed into Super Cheese (Drew Holloway), Professor Pinstripe (Daron Henry) and Mustachio (Jack Forman) to create this super CD, made just for the little super heroes in our lives. While listening to this CD, I found myself tapping my feet along with the first song and bopping to the following tunes. Definitely catchy and down to earth, it makes you imagine what its like to be a superhero on the playground and picks your mood up, even if you were happy to begin with. What kid doesn't love superheroes?! No matter the generation, we always love our superhero movies and wished that we could be a superhero ourselves. So, this CD caters so well to that genre that I'm sure kids will love it! Recess Monkey's last CD, 'The Final Funktier' was on the "Best of 2010" lists by amazon.com, Parents Magazine, The Washington Post, Time Out NY Kids, and so many more and I can't imagine why not, this CD was absolutely awesome! To be released June 21, I am so glad I was able to get my hands on it to review it first. I absolutely love it and think its something that fans of Recess Monkey should look forward to. If you'd like to see them before the release of their new CD, check them out at their 2 CD release "Sneak Preview" shows in NYC. Buy It: Flying can be purchased for $14.99 from Amazon.com, CDbaby.com, and recessmonkey.com, bigkids.com, theAVcafe.com, and iTunes June 21, 2011. Oh, I am so with you on this, what kid doesn't love super heros?! I had never heard about this group before and it works out perfectly because my lil nephew has a birthday coming up. Great giveaway, girl! woo hoo I am follower number 650!